Symbols are a universal language, and many are hundreds or even thousands of years old and have been inspiring humankind for generations. This 40-card mini deck features a combination of medieval amulets, Celtic charms, alchemical glyphs, and channeled sigils from Priestess Moon�s guides and angels, as well as an explanation of how each symbol can help you. 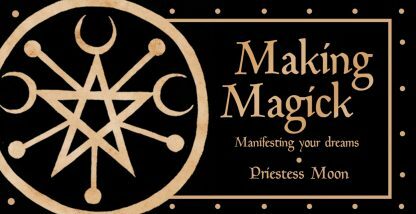 Making Magick is a potent tool for manifesting your desires whether they be for wisdom, protection, healing, love, fortune, insight, or whatever you�re dreaming of. Priestess Moon is a West Australian artist with 5 solo exhibitions to her name, as well as numerous group exhibitions. She runs an art and design business, Priestess Moon Design, which specializes in bespoke artworks, handmade spells, sabbat cards, and oracle decks. She brings an element of enchantment to her work and imbues it with an insight and beauty inspired by the spirituality of the natural world.